Our next meetings will be Sunday the 25th of September. We meet at the Masterton Croquet Club, next to the mini-golf at Queen Elizabeth Park, on the second and last Sunday of each month, 1pm to 5pm. Hope to see you there, playing a game or just coming in to talk toy soldiers! Neil was good enough to take some photos for me at the last club day. As always, if you have more to offer or comment, then chime in down below! A full crew playing a board game - Temple of the Beastmen? Ross and Peter on the right, and I think it's the back of Garys head in the right foreground. Ross and Peter deep in thought, while Gary chortles about a dirty trick he's just pulled on them. 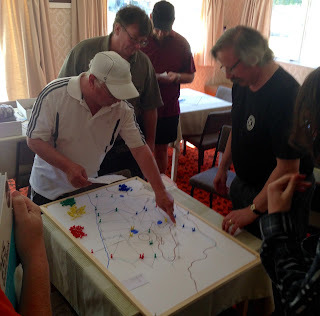 The current state of the Hordes of the Things Campaign map that Craig is running. The current state of the Machiavelli campaign - watch those neutral cities and provinces getting hoovered up! David preparing for his campaign fight. 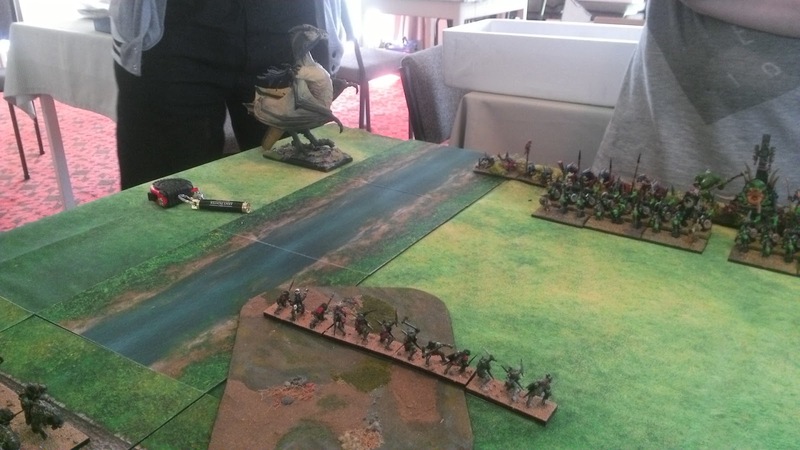 The greenskins join battle with their mighty..........Duckragon? The joys of an element based wargame are that your imagination has no limits, provided you can fit it on the base! 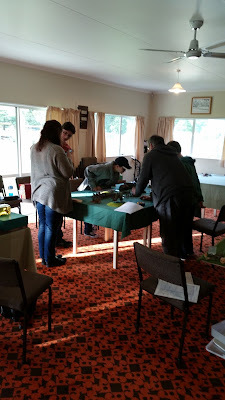 This is a few photos I took at the July and August meetings. If you're in them, and want to add any details, then chime in in the comments. 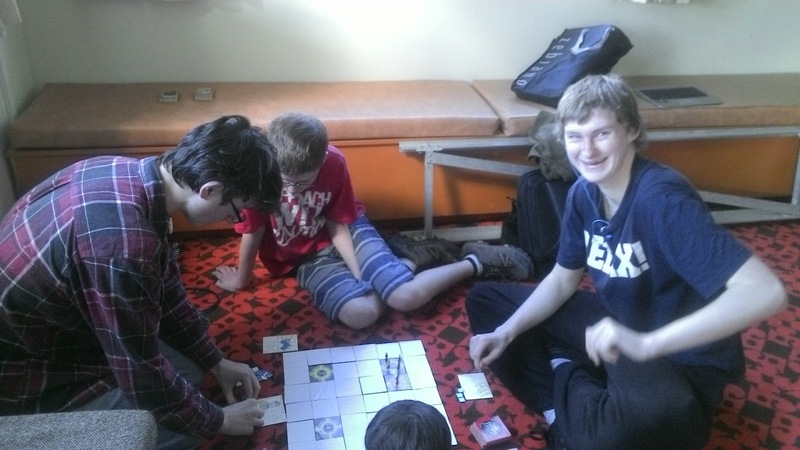 James and Peter playing Hordes of the Things, while Ross, Winter and Craig look on. Craig and Peter to the left on the HoTT table. 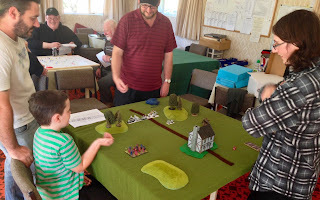 In the background Jim and Rex are playing Black Powder, while on the right Harley is chatting to someone behind mine and Neils Kings of War game. Rex and Jim playing Black Powder on a very artillery-friendly table, while Ceilidh explains the rules to them. 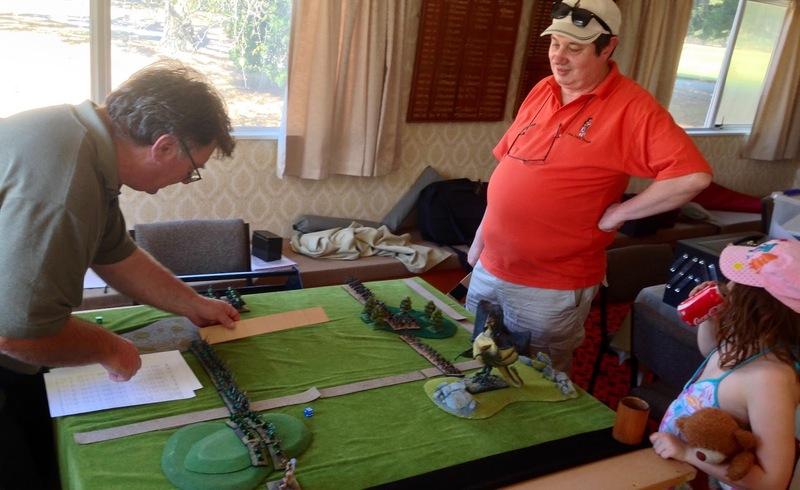 Craig is setting up to destroy James, while his teammate Peter looks on in awe at his generalship. 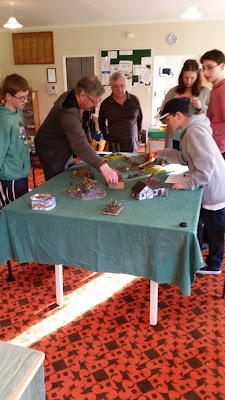 Ross is considering how to destroy his Dads army while Neil and Winter watch from the sidelines. Start 'em young! 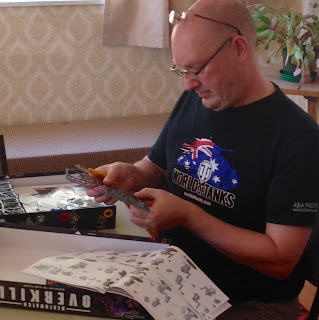 Spencer checking out the Kings of War game I played with Neil, comparing Dads undercoated figures with Neils fantastically painted force. The beginning of the club Machiavelli campaign. 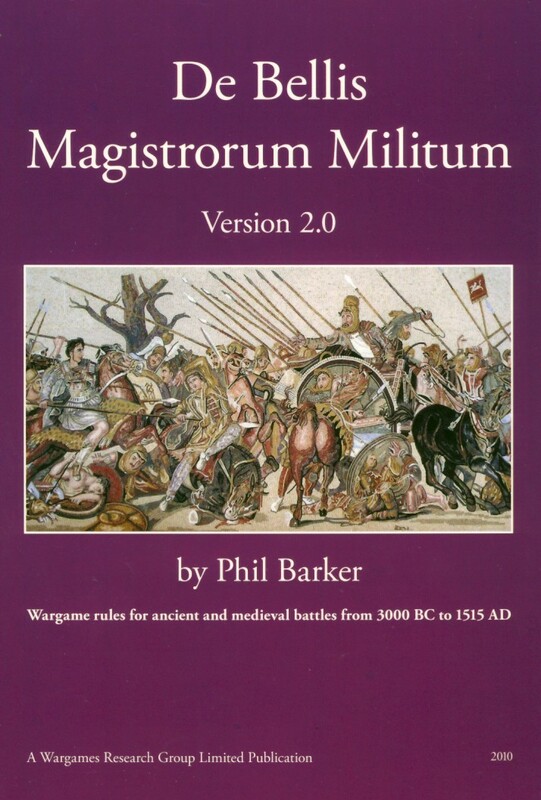 This is a strategy boardgame set in medieval Europe. which is currently involving a large part of the club. From left to right - John, Ross, Craig, Jim, Rex and Neil. I'm behind the camera, and young James and Peter were late that day. Jonathon has been getting into Black Powder in a big way - his first wargaming love was Napoleonics. This stunning table is all his terrain, and his painted armies look even better then the terrain! From front to back - Rex, Jim and Jonathon. 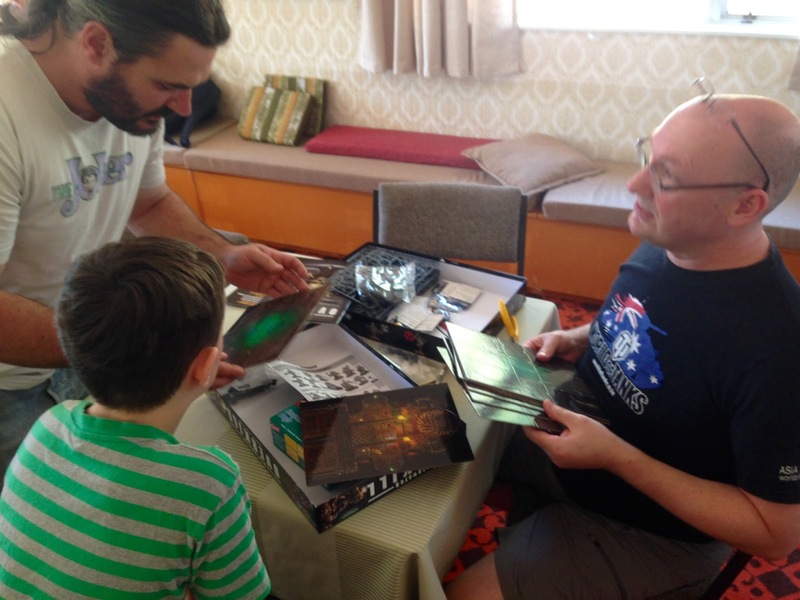 Harley and Jonas chatting about whether to break out their old Warhammer armies to give Kings of War a try. Can't remember who's back on at the left, and at the front Spencer is impatiently waiting to get back to pushing little men around the table. Craig brought along the board game Maharaja and he, Rex and John played. Jim came along later, gave moral support and said useful things like "oh - I wouldn't have done that". Craig also did admin for the club campaign. Remember, next club meeting we will the next rounds of the campaign. Ross brought along two Hordes of the Things armies, Space Marines and Minas Morgal (I think). He, Eric and Winter played. 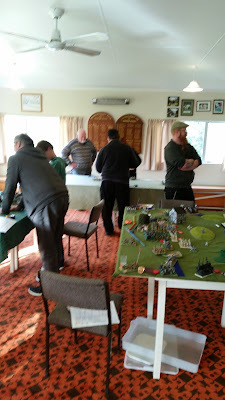 Andrew (Patrician Romans - very late, when there was no effective central control in the west) and Vince (Early Byzantine) played 25mm DBMM (Ancients) getting ready for the Hutt Club's Winter Cup next month. A pic across the hall, DBMM ancients at the front, Maharaja left, and Hordes of the Things right. 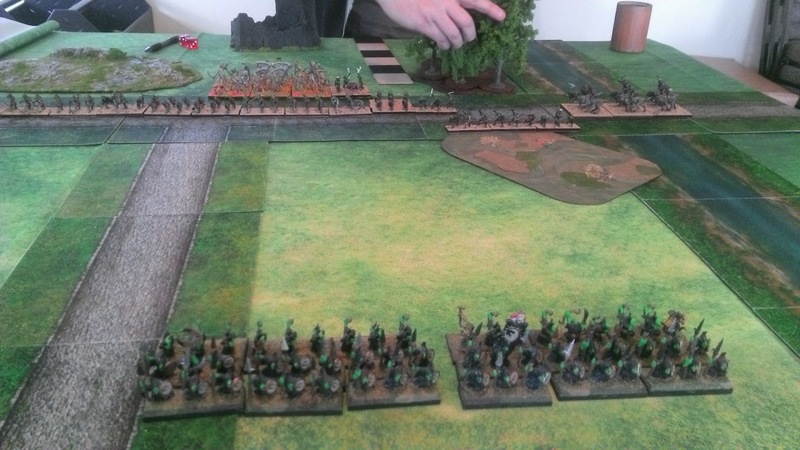 Vince's Byzantines are Hinchcliffe, true 25mm. Andrew's irregular auxiliaries are 28mm plastic - spot the difference! Size did matter. Even with their bases unfinished the barbarians, Irregular Ax(S), were more than a match for my reg Bd(I) skuatatoi. John in full concentration and Jim is watching. 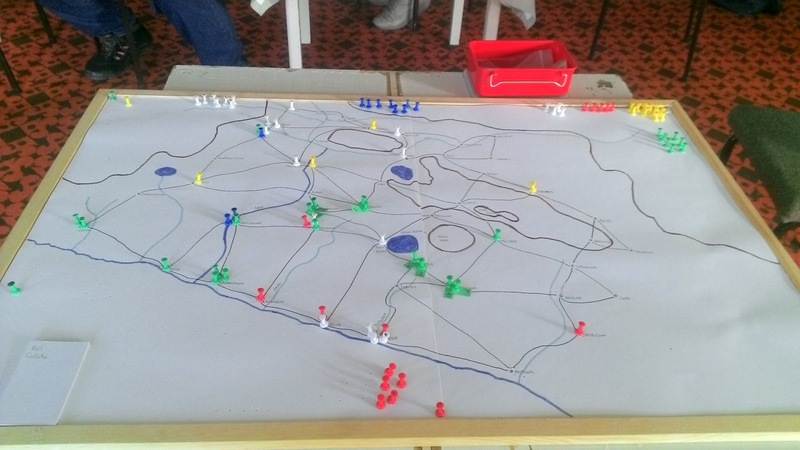 The board early in the game. 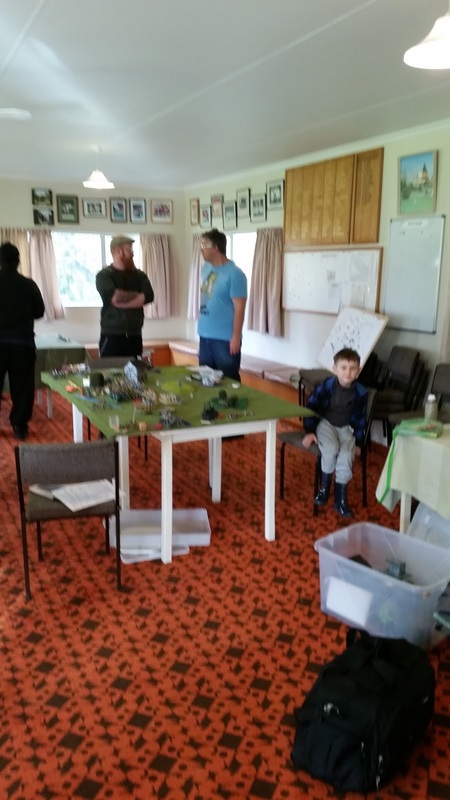 Great to see so many people at the club today - the club Hordes of the Things (HotT) campaign is proving a great success at getting people involved. 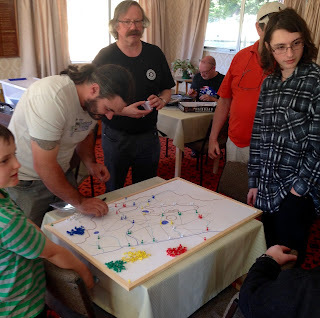 The next campaign season, and then winter, will be at the club meeting on June 26. Two tables were used for multi-player campaign games, another was used for a non-campaign HotT game, one table was Napoleonic and there was also an American Civil War boardgame. Welcome to Erik who had not been to the club before and Roger visiting from the United States. Others there were James the Elder and James the Younger, Peter, Sam, John, David, Rex, Ross, Craig, Jim, Andrew, Neil, Jonas and Vince. 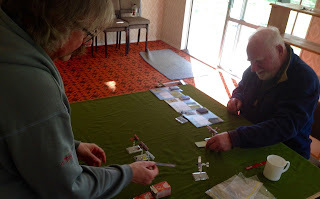 Roger with his Battle Cry ACW boardgame. 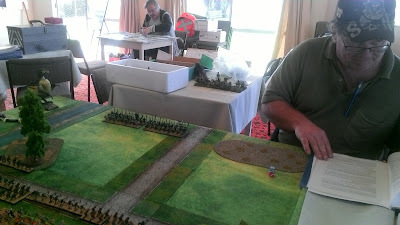 Jim (Russians) and Rex (British) getting their Napoleonic game underway. 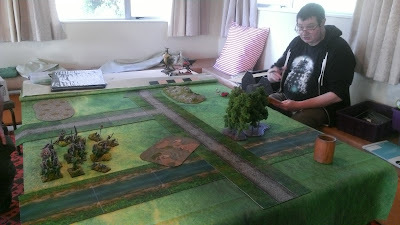 James the Elder (Dwarves), Andrew Tyrannids, Craig (Hos Hostigos), and Neil (Bretonnians) played out one of the campaign games. The game ended with Andrew's force besieged and then the city taken! Andrew is out of the campaign. 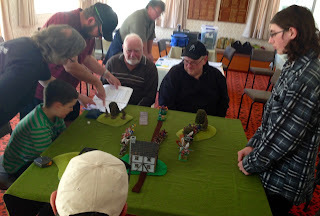 John (Early Imperial Roman) and David (Goblins) getting in a practice game for the campaign. Young James (Lizardmen) and Peter (Tomb Kings), watched by Sam and helped by Ross (and also by David and John) took on Vince's Early Byzantines. In a bloody encounter, James and Peter lost their CnC but Vince had the larger of his two commands demoralised and was forced to retreat. Vince has rallied his army and recovered some of the troops from his demoralised command. They will fight again! 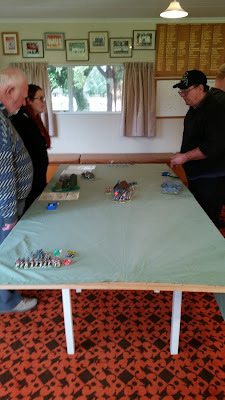 Two tables were being used at today's meeting, one for 25mm Ancients and the other for World War 1 dogfights. 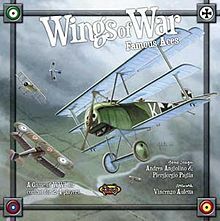 David (Anglo Danes) played Vince (Early Byzantine), and Craig and Rex played several World War 1 dogfights. Good to see Jim and James at the club too. DBMM 2 are the Ancient and Medieval rules that are most commonly used in the Wellington region. They will be used for the Hutt Valley Clubs "Winter Cup". David making the first move with his Anglo-Danes. Vince and David were getting in some practice for the Winter Cup theme, river crossings. 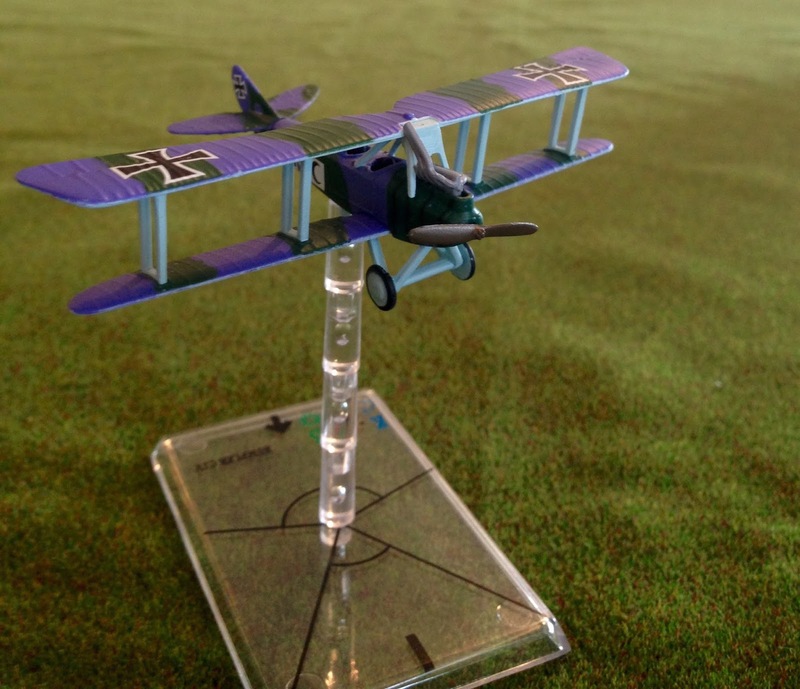 Wings of War are run, quick play rules for World War 1 dogfights. 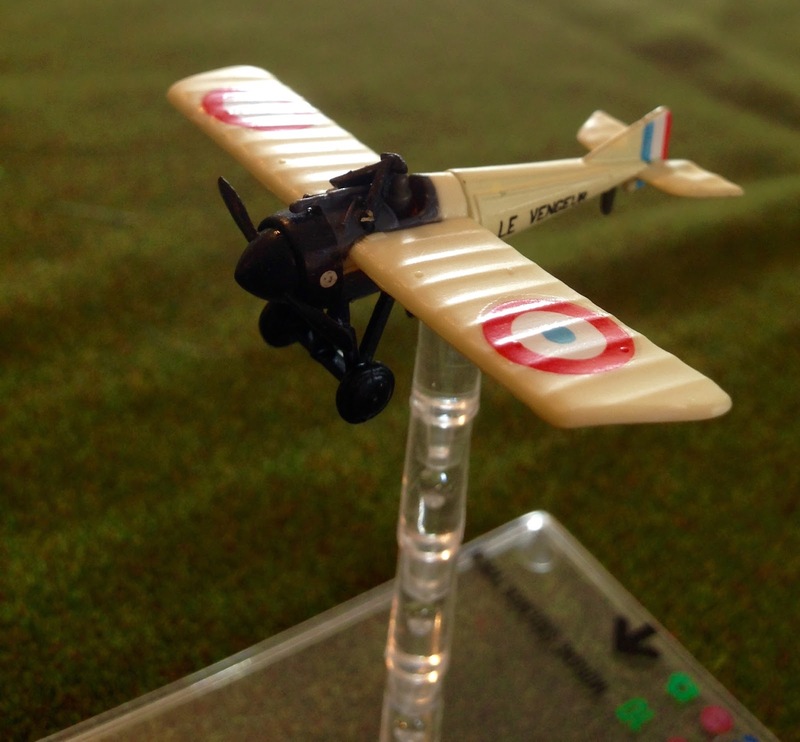 Craig brought along part of his extensive collection of aircraft. Craig and Rex get into action. A couple of Craig's models. The club campaign uses the quick play Fantasy rules, Hordes of the Things. 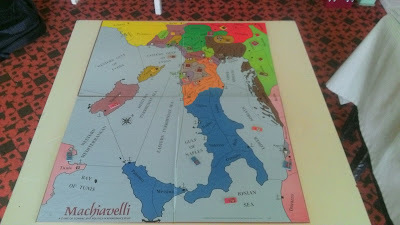 It is run by Craig and uses a map of Italian city states around Rome. The armies are both Fantasy and historical. Sunday saw all of victory, defeat, betrayal and plotting as the mid and late summer periods were played out in the club campaign. Ross (Minas Morgul) has become the first casualty, retreating into his citadel when attacked by Craig (Hos Hostigos) and Neil (Bretonnians). The siege was unsuccessful. Ross's relieving army arrived and the besieged force sallied out but all to no avail. Dad and the other veteran prevailed, Ross's armies were defeated and his capital taken. Meanwhile Andrew (Tyrannids) and Neil fought a skirmish with their smallest forces. Neil got the better of it but with such small numbers involved the outcome will probably not have a major impact on the campaign. Young James (Lizardmen) and Peter (Tomb Kings) were led astray by John (Early Imperial Roman) and attacked their mentor and protector, Vince (Early Byzantine). 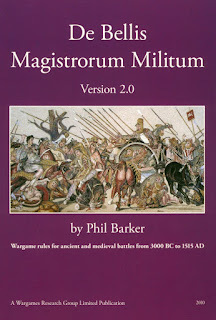 The armies of Byzantium have converged under the leadership of Belisarius himself and will smite the whippersnappers in autumn. Trust me, I am a Byzantine. 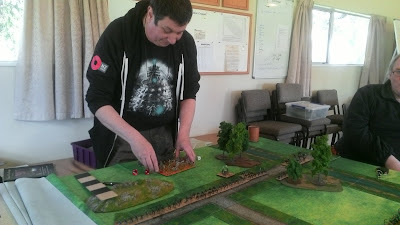 The other major clash to come in autumn will be both Neil's armies supported by Craig taking on James Senior (Dwarves) and Andrew. One of Neil's armies will start on the table but the other and Craig's force will dice for arrival. 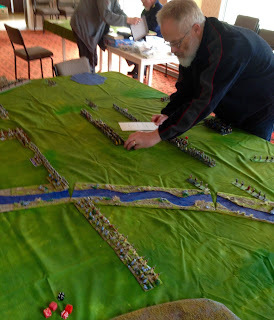 Rex (Napoleonic British) has been playing a cunning strategy and has allied himself with Neil and Craig. Rex also has an alliance with John. It seems to be paying off and the British web is spreading. Intelligence is sparse about what Goblins one and two, Jim and David, are up too but I am sure we will find out soon enough. My apologies for the lack of photos from the club meeting. I was unable to attend - it is a complicated story that includes a visit to an emergency vet in Maidstone. 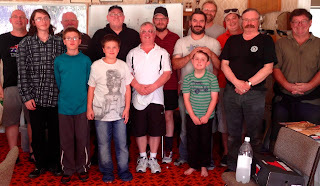 The February 13 meeting had a dozen people playing in the first three seasons of the club campaign, and a few others dropping in too. Craig has organised the campaign using the quick play Hordes of the Things Fantasy rules and a map of Italian city states and villages centered around Rome. 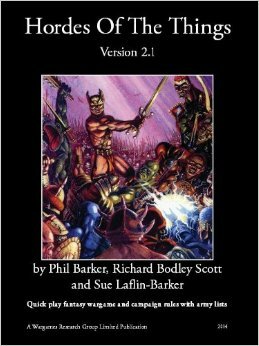 The armies are a mixture of historical and Fantasy. 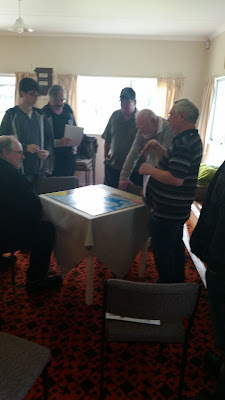 It is being played at one club meeting each month. 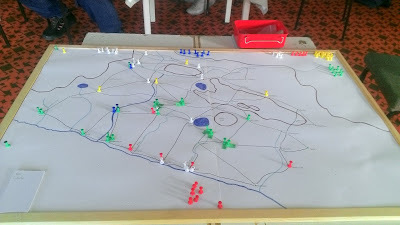 The campaign generated lots of noise, four battles, a siege, a fifth battle to be played, and the understanding that of course you can trust me, I am a Byzantine. Peter and and James G learned a lesson about punctuality - they arrived late and had already lost most of their villages. A great northern alliance is forming and morphing each season, while in the South three factions have formed. Here are some pix from the meeting, with the list of those in the campaign below. 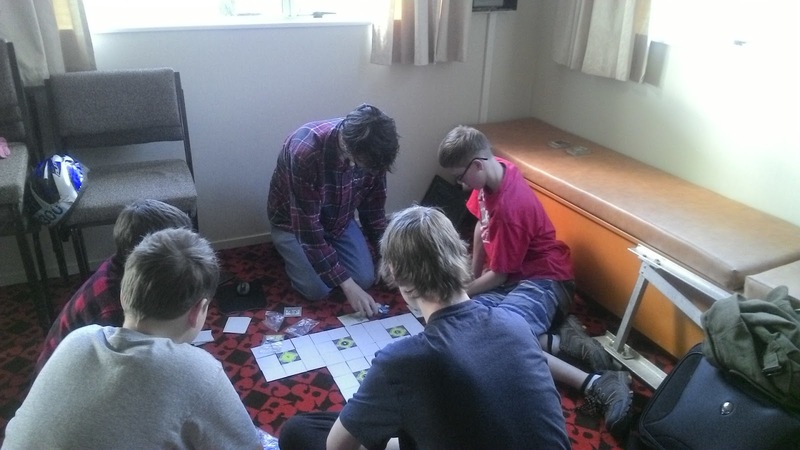 Craig got off to a flying start in the first game (ho ho), which might become know as the Battle of Six Ones. Neil was outside playing croquet so Craig stepped in using Neil's outnumbered Bretonnians vs Ross' Army of Minas Morgul. 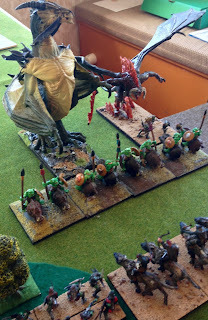 Andrew's Tyrannids were scuttling along to arrive on a flank at some time in support of the Bretonnians. Ross decided for immediate, all out attack before Andrew could intervene. 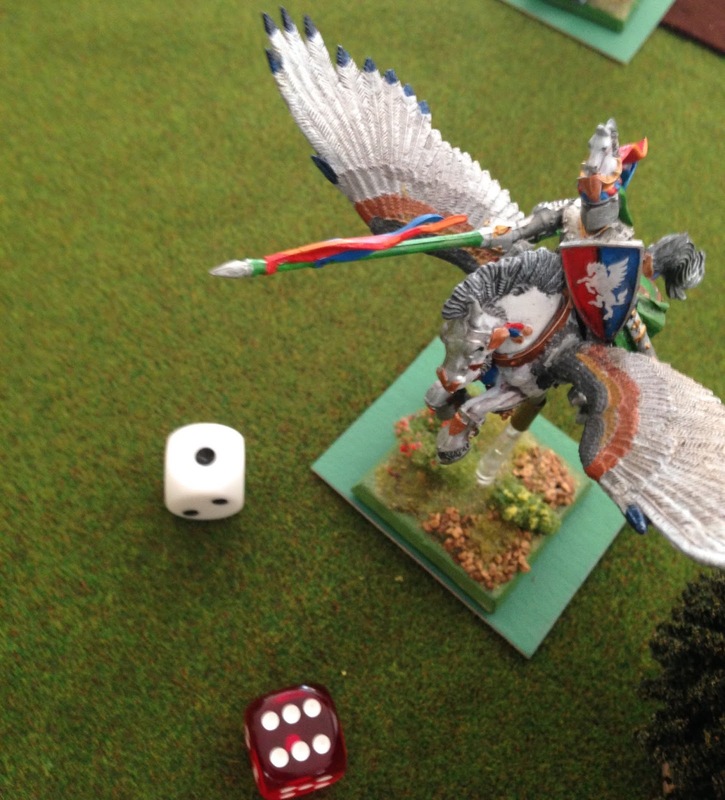 Ross says it was his cunning plan - Craig said it was an appalling string of ones on his dice. Whoever you believe, the Tyrannids arrived just in time to see the Bretonnians routed! 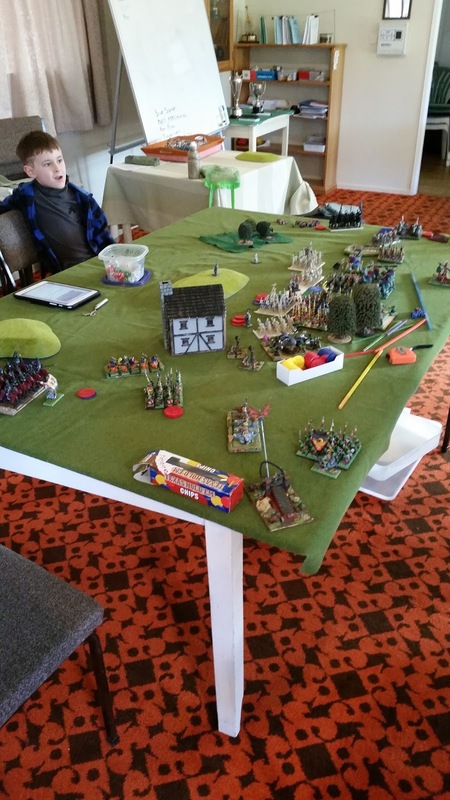 Andrew then chose to not engage and the Tyrannids marched off the table - brave, brave Sir Robin! Grayson had come along to support dad, club president James (Dwarves), Craig (Army of Hos-Hostigos) is the top chap running the show, and Ross is clearly planning something cunning. 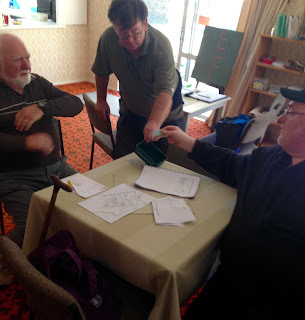 Neil (Bretonnians), Jim (Goblins) and Craig (Army of Hos-Hostigos) - the game is afoot! The Battle of Six Ones in progress. Grayson and Craig are all eyes and ears as Andrew ponders the rules about not fighting! Rex and John are intrigued. Ross is not too worried. Jim and David played out a Clash of Goblins. No Titans here, just little, green, snot gobblers! Well, not exactly no Titans. David's Goblins had a hero on a very nasty budgerigar and the smaller but even nastier thing on the extreme right is a god he had summoned. Not a good day for Jim's Goblins but he fought most nobly against improbable odds to keep the "Team Evil" southern faction distracted. Did I tell you the "Righteous" southern faction includes the Early Byzantines? Grayson about to roll dice for his dad, James (Dwarves). Andrew was providing moral support. Ross (Army of Minas Morgul) came unstuck this game when his hero collected a cannon ball. Gregory brought along his Death Watch Overkill box to continue assembling the figures. 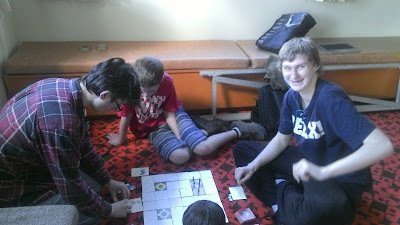 Grayson and James checking out the embossed tiles that came with Gregory's Overkill set. 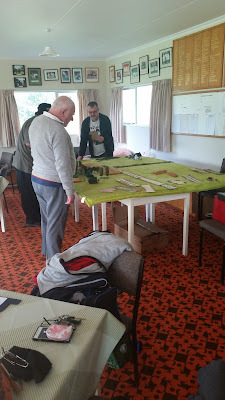 Some of the action in the hall. Team photo.- Back row: Gregory, Ross, Rex, John, Andrew, James, Vince (Byzantines rock! ), David. Front row: Ross, Peter, James G., Neil, Grayson, Craig, and Jim. Missing from photo: Callum. Playing in the Hordes of the Things campaign are: Andrew, Tyrannids; Ross, Army of Minas Morgul; Craig, Army of Hos-Hostigos; John Early Imperial Roman; Peter, Tomb Kings; David Goblins; Jim Goblins; James T., Dwarves; Games G., Lizardmen; Neil, Bretonnians; Rex, Napolenoic British; Vince, Early Byzantines. - Warlords Spring - Kings of War, held on September 17th. 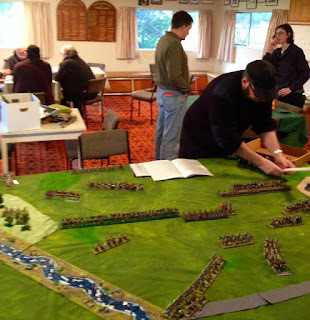 - Kapiti Fantasy - Kings of War and 9th Age. Held on 22/23 October. - Vermintide on November 12th. Another run by Neil! More information and links to Players Packs can be found on the Fields of Blood event calendar here.